At Walmart, we are committed to doing business the right way. We’re constantly striving to earn and keep the trust of our customers and the communities where we work and live. One way we meet that commitment is through the company’s ethics and compliance program. Our program helps our company identify key risks in our business, develop standards and processes to address those risks, and then bring those standards and processes to life in our business. Over the last few years we’ve made significant investments to enhance these capabilities. We have highlighted some of that work in prior annual reports on our ethics and compliance program and also in Walmart’s annual Global Responsibility Reports. Because our business and the world are constantly changing, over this last year we continued to develop and refine our company’s governance processes. I’m pleased to share some details from those efforts in this third annual report on our ethics and compliance program. In this coming year and the years ahead, the company will continue to focus on building a world-class ethics and compliance program to prevent, detect, and remediate issues that arise in a growing business. To do that, we must embed our ethics and compliance processes in our business and challenge ourselves to continually improve. This report highlights some of the latest progress on this journey. Walmart’s culture emphasizes integrity and respect for others. This cultural foundation is critical to Walmart’s success because it provides our associates with shared expectations and a common understanding of what is important. Our ethics and compliance program builds on that cultural foundation. With the many complex issues our business confronts, we need both a strong culture and effective governance to achieve our goals. Accordingly, several years ago we began implementing significant structural changes to enhance our ethics and compliance efforts. These changes have now brought into one program many of the functions and processes that help our company follow the laws and regulations that govern our business. Having a unified global program has brought a consistent, coordinated approach to our compliance work and has allowed us to apply learnings from one part of our business across all of our operations. As part of our oversight of the company’s compliance program, for the last several years the company’s senior management has worked with the Audit Committee of Walmart’s Board of Directors to identify high-priority projects to move the program forward. The company continued this approach in the fiscal year ended January 31, 2016 (“FY16”). Early in FY16 the company and the Audit Committee identified 40 such high-priority objectives (the “Objectives”). Those objectives were selected based on information we gathered about our operations throughout the year. In addition to the normal feedback we receive in our business, we conduct annual risk assessments in each of our retail markets and also use innovative systems to collect data on our compliance efforts. Several of those systems are discussed below. This focus on data and analytics helps us to understand our risks and prioritize our efforts. As in past years, the Board’s Compensation, Nominating and Governance Committee (the “CNGC”) conditioned a portion of the compensation for the company’s most senior executives on demonstrating adequate progress in achieving the Objectives. Under the oversight of the Audit Committee and CNGC, the company assigned responsibility for each of the Objectives to one or more members of our senior executive team. Our senior management regularly reported to the Audit Committee and CNGC on the status of the Objectives throughout the year. At the end of FY16, the Audit Committee conducted a review and concluded that the company achieved adequate progress on all 40 of the year’s Objectives. In light of these results, the CNGC elected not to exercise its discretion to reduce our executives’ compensation. This report discusses some of the Objectives that the company achieved over the last year. The report also provides data and examples from the company’s broader ethics and compliance program to provide context for our efforts and show how the company’s governance processes have continued to improve. We believe that this process of continuous improvement is critical to our company’s success. One of the most significant changes this year involved merging our global ethics and compliance programs. Walmart started its ethics office over a decade ago as a place where our associates could turn for advice and guidance. Over time the ethics program evolved and took on an increasing role in educating our associates on ethical and policy issues. The ethics program maintains Walmart’s Statement of Ethics, which sets out our company’s fundamental expectations for our Board, our management, and every associate to act with integrity and objectivity. We publish our Statement of Ethics in 20 languages and disseminate it in a variety of ways to make it accessible to our associates and business partners. A copy of the current Statement of Ethics can be found here. The ethics group also provides confidential mechanisms for individuals to ask questions, seek advice, and report concerns. The company makes associates aware of these communication avenues in a variety of ways including associate training, messages from managers and senior leaders, and reminders such as posters in our stores, clubs, and other facilities. I’m pleased to report that our associates and stakeholders are utilizing these communication channels. In FY16 the number of contacts we received from internal and external stakeholders increased by 19%. This is the fifth consecutive year that the number of contacts has grown. The increasing contacts let us know that people are aware of these resources and feel comfortable using them. As these contacts come in, the ethics group tracks the information we obtain, works with the appropriate group to investigate concerns, and coordinates with the business to resolve issues that are identified. Approximately 47% of the contacts we received last year were classified as general questions (rather than issues relating to ethics matters), but we still find these communication methods helpful for providing our customers and associates with opportunities to give feedback and ask questions. As our ethics and compliance programs developed over the last few years, we decided it was time to refine our overall design. Our ethics and compliance functions are closely related, as both are involved in identifying and preventing risks, responding to issues, and educating associates. We therefore decided to merge the departments. This merger has enabled better collaboration, efficiency, and effectiveness across the groups. For example, as the individuals who handle ethics contacts identify trends in compliance matters that are reported to the company, they are better positioned to raise those issues with their colleagues on the compliance team who manage those subjects. Additionally, by working together the ethics and compliance groups have consolidated our training and tailored it to better engage our associates in the learning process. After spending several years enhancing the compliance program, in FY16 Walmart commissioned a third-party evaluation of how effectively we have implemented these changes. The company engaged an external expert to assess our improvements to the compliance program in a number of international markets. This review helped us to ensure that we are moving in the right direction and to identify areas where we can make further progress. We continue to look for ways to refine and evolve our program design and to improve the execution of ethics and compliance initiatives. We are committed to maintaining a world-class anticorruption program and continue to devote significant resources to do so. As part of this continuous effort, we look for new ways and new technology to manage our risks efficiently and effectively. Walmart’s anticorruption program was designed and implemented based on the advice and guidance of internal and external experts. This design includes a global anticorruption policy and market-specific anticorruption procedures that address a number of topics such as due diligence in engaging third parties, business expenditures, charitable contributions and sponsorships, licenses and permits, acquisition or lease of property from government entities, government inspections, recordkeeping, and reporting allegations, among others. We continued to build and refine the program in FY16. At the end of the year, we had a team of more than 100 dedicated anticorruption associates who live and work around the world, but who report centrally and are led by a dedicated global anticorruption officer. Together, these anticorruption associates conduct due diligence and an annual risk assessment, develop and provide anticorruption training and messaging, oversee the implementation of anticorruption policies and procedures, and monitor and evaluate our program. In FY16, we expanded our program for regularly monitoring our company’s performance in implementing our anticorruption policies and procedures. The company now has a global continuous improvement team that constantly assesses and improves the implementation of the program in all of our retail markets. This monitoring provides feedback to the business on how they follow the company’s anticorruption controls so any issues are identified and addressed early. This monitoring does not replace the work of our Internal Audit team, which continues to perform its independent auditing function. Rather, we view this monitoring as an additional line of defense against anticorruption risk. Like many businesses, we sometimes need third parties to interact with the government on our behalf. These third-party intermediaries can help us with regular business activities such as responding to government requests for information, handling legal or regulatory proceedings, and real estate design and construction. These third parties provide needed expertise and make our processes more efficient, but because these individuals and companies interact with government officials around the world, they also impact our risk profile. We seek to be both innovative and deliberate in managing this risk. We have created a thorough process to screen and conduct due diligence on potential third-party partners. As part of that process, we worked with external experts to create a customized electronic system that screens for third-party intermediaries in our business and conducts due diligence on individuals and companies who seek to represent us. Additionally, when we contract with third-party intermediaries, we require them to adopt commitments to follow our anticorruption policies. We want to help our third-party partners understand and apply these anticorruption standards, so we’ve invested heavily in anticorruption training. As of the end of FY16, we have provided anticorruption training to over 1,300 third-party companies and groups. In addition to reducing our risk by providing this Walmart-developed training, we have also provided our third-party partners with the ability to share our anticorruption e-learning training with others throughout their organization. This past year we also developed what we consider to be a leading practice in anticorruption compliance. In addition to the screening, due diligence, contractual commitments, and training that we utilize, we partnered with external experts to develop a methodology for proactively auditing a sample of our third-party partners in our higher-risk markets. These audits are not triggered in response to a concern or allegation about the third party. Rather, under our new protocol, we selected a sample of companies for an audit based on several factors, including the risks associated with the region where the third party operates and the type of service that it provides. Through this process, we were able to examine the way that the third parties responded to our anticorruption program and identified areas where we can continue to improve our training and controls. Because of the insight these proactive audits provided, in fiscal year 2017 (“FY17”) we intend to expand this program to all of our retail markets. 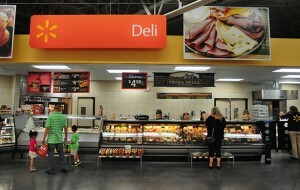 Walmart serves millions of customers in thousands of stores around the globe each day. Because we touch the lives of so many people, we have an important responsibility and unique opportunity to advance food safety and improve public health. Providing safe and affordable food to our customers is one of the reasons we continue to be successful in an increasingly competitive environment. As leaders in the retail food business, maintaining a progressive and effective food safety management system is a critical part of our continued success. In addition to promoting food safety within our stores and clubs, Walmart has enhanced food safety in the marketplace by helping to create and implement recognized standards for cleanliness and safety in food production facilities. As noted last year, Walmart was a founder of the Global Food Safety Initiative (“GFSI”). GFSI is a global, multi-stakeholder effort that establishes appropriate food safety standards for various types of food production operations. The GFSI food safety standards are internationally recognized and meet or exceed regulatory standards worldwide. Additional information on GFSI can be found here. The process of obtaining GFSI certification for a facility is intensive and may take several years. Since first requiring private label suppliers to obtain this certification in 2008, we have extended the requirement to other food products including fresh produce, meat, fish, poultry, and ready-to-eat foods. As a result, we’ve seen reductions in recalls while simultaneously promoting confidence in the food supply. In FY16, Walmart continued to build on this progress internationally by significantly increasing the percentage of company-owned and private-label food production factories certified to one of the GFSI recognized standards. The number of Walmart’s international suppliers of private-brand products who are certified against a GFSI standard nearly quadrupled between 2010 and 2015, from about 1,000 certifications in February 2010 to nearly 4,000 in December 2015. More than two-thirds of Walmart’s company-owned food manufacturing facilities are now GFSI-certified, and the remaining locations are on track to earn certification in the next few years. In our stores and clubs, Walmart’s food safety program relies on standards for safe food storage and preparation, processes that incorporate food safety principles, training on our standards, and monitoring to verify that the standards are being met. The company developed the SPARK food safety system to make these efforts more efficient and effective. SPARK uses electronic hand-held devices to record food temperatures. Because the results are digital, SPARK allows the company to identify trends and correct issues before they become problems. SPARK also allows instantaneous training to the associates who are using the device. For example, when an associate is measuring the temperature of a particular food, the device can immediately display the correct temperature range to the associate. Because of SPARK’s proven benefits, the company has undertaken a multi-year project to install it in our international stores that sell fresh food. (SPARK is already installed in the relevant U.S. Walmart and Sam’s Club locations). There are technical challenges in installing SPARK internationally, but in FY16 the company installed SPARK in over 600 additional international locations. We intend to continue rolling out SPARK in our international locations in FY17. Helping people has always been core to Walmart’s mission and the foundation of our business. It not only applies to our customers and associates but also to our suppliers and manufacturers who make the products we sell. Walmart’s supply chain reaches communities throughout the world. When handled well, that supply chain can provide opportunities for hundreds of thousands of individuals to improve their lives. In FY16, Walmart continued to use its purchasing scale to shape the world for good by further enhancing transparency in the supply chain and refreshing how the company conducts supplier audits. These efforts are highlighted in additional detail in our 2016 Global Responsibility Report. We conduct an extensive program to train associates on issues relating to ethics and compliance. Successful training provides our associates the information and skills they need to do their jobs well. In FY16 alone we delivered some form of anticorruption training to more than 100,000 Walmart associates at all levels and provided live, instructor-led training to more than 18,000 associates selected based on their roles and likelihood of encountering anticorruption issues. While live, instructor-led training is often our preference, the volume of this training program demonstrates the need to use electronic systems to deliver and track training globally. With over 2.3 million associates world-wide, we are working to leverage technology and increase consistency across our training program. In FY16, we continued rolling out a computer-based Learning Management System in our international markets. This system provides a platform for delivering training targeted to specific roles and provides greater accuracy and efficiency in how we track and document our training program. We will continue the implementation of this system in additional international markets in FY17. Walmart’s Global Donation Management System (“GDMS”) is another example of recent enhancements to our ethics and compliance systems. GDMS is a web-based application we created to manage donations to governments, charities, and other non-governmental organizations. GDMS has two components: a website to manage due diligence, registration, and approval of potential donation recipients; and a store solution to manage approval and accounting for product donations that are made at the store level. Through the website, potential donation recipients can register their organization and submit a funding request, which is then routed automatically to our anticorruption due diligence tool discussed above, and from there to our internal approval process. At the store level, associates can use GDMS to scan products to be donated to a recipient and the tool will automatically validate that the potential recipient has been approved through our processes, while also validating that the product to be donated is appropriate (for instance, donations of tobacco products are automatically restricted but food, water, and clothing are permitted). Walmart has a long history of supporting the needs of our communities. In 2014 alone, Walmart and the Walmart Foundation gave $1.4 billion in monetary and in-kind contributions around the world. Global in-kind donations accounted for approximately $1 billion of that amount, while monetary donations of approximately $309 million were given globally. Additional information on these efforts can be found here. GDMS facilitates such contributions while also reducing our risk by making the process for reviewing potential donations more efficient. Walmart implemented GDMS in several of our international markets in FY16. We plan to expand the system to additional markets in the coming year. These examples from FY16 are part of our larger efforts. We are committed to having an ethics and compliance program that is effective, sustainable, and tailored to our business risks. Because our business is constantly growing and the world around us is changing, we will continue to invest and change in the years ahead, as well.